Garden Design Dilemma, What Should I Do? We moved into this new home and I have this gladiolus here in the forst picture, creamy yellow and pink when they were blooming. Forgive my puppy, she's sunbathing and wouldn't move. The Gladis, I feel they don't fit there, the bluish purple new plant on the right side is Russian Sage I just put and it'll grow like 4 feet round. The second shot is just for the better view of the surrounding. 1. Gladiolus, What would be good there? OR Should I leave the ground bare and fill with rocks or wood mulch? , The space got full sun all day. 2. I want Russian Sage there one way or another, should i move? What would be your ideal? 2. In the third picture, it's the space on the east side on the house next to the fence, what would fit there?, it's bright place got around 3 hours of sun from 11:30 to around 2:30 pm. Re: Design Dellima, what should I do? Looking at your pictures, I keep feeling like the glads are too far in the front of the border while the low growing mounds of white flowers are too far to the back. Where the low plants are it feels like you need more height -- I'm seeing too much fence. Also, in the corner, are those glads around the tree? They look like they are crowding the tree and don't work together. The glads are too tall to be planted surrounding the trunk like that. ...are these the kind of thoughts you are looking for? And where are you located? I googled North Delta and got results in Mississippi, Louisiana, California, and British Columbia... I'm guessing Miss. or LA, but it would be nice for you to tell us; there's nothing distinctively Southern about your garden. If you are in the deep south, perhaps you want something more tropical that would look like a southern garden? To start with re design principles, I am personally opposed to straight lines. There's no reason why your row of fence line plantings needs to be a straight line; nothing in nature is. To Applestar : Thanks so much.! I want to know what would you replace with. The corner ones are not gladis, they are peacock lilis, fragrant and white and deep purple flowers coming out soon. Fabulous! You open my eyes, why should I keep it straight? Thank you! The fence is for the reason to keep my dog out of the garden area. You're right. I'm in southern BC, Canada. I'll edit my signature. Here, glads will freeze in the ground over the winter so they have to be lifted and stored in fall. To be companion to russian sage, you will need drought tolerant full sun plants adjacent to it or you will drown the Russian sage trying to keep them watered. I assume drainage is good there? Sedum is another drought tolerant late summer/autumn bloomer. Lambs ears are nice, as are silvermound artemisia if you want to go for all frosty look. It would be a good idea to fill in with other season bloomers, too. How about tree or herbaceous peony? Maybe add a trellis and well mannered annual or perennial vines up the fence. Clematis could make it there if the roots are in the shade. I like height in the back. If you want edibles, you could consider black and raspberries and strawberries, asparagus.... Herbs like lavender, oregano, and thyme... Rosemary? Flashy culinary sages like tricolor or variegated. You could grow ornamental hardy banana and palm too if you wanted. Thinking you need to come up with a theme -- color, function, geographical, etc. and think about different seasons, foliage textures, and heights. Re: Garden Design Dilemma, What Should I Do? Sorry, I forgot to put the picture credit under it. That is not my garden, it's just a picture I found on Google images to illustrate what I was talking about it. There are pictures of my garden posted around here. If I get a chance I'll try to find a link. Applestar has given you some good suggestions, including that it has a lot more impact if you find a color scheme / theme. You could do all purples and blues with some white accents for a very cool, peaceful effect. If you are really disciplined, you could go for all white, with lots of white and silver foliaged stuff, for the ultimate in serene elegance. Or you can do something high contrast like purples and yellows for a very dramatic, energizing effect. ETC. The nice thing about landscape design is that you can't go wrong. It's flowers, it will be beautiful! Thanks a bunch ya two ,make my day with a flowery list to go on . Will come back for sure again. Since the glads and irises do not bloom year round and they have the same shape and texture. I would break them up into groups minimum of three to a group. 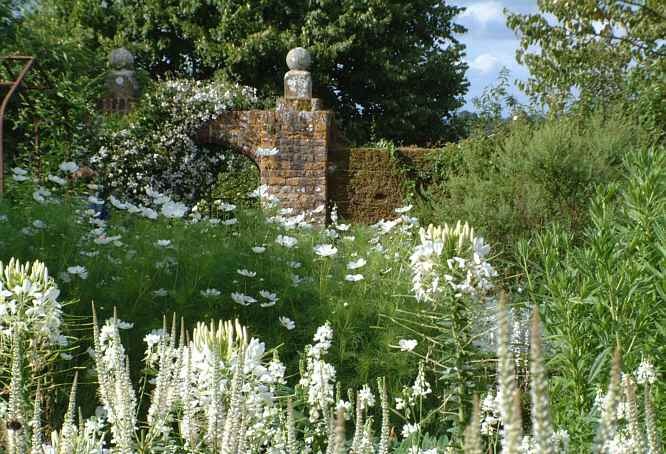 Plant the alyssum in the front of the glads and something taller behind the glads to soften the height of the fence. Use different textures shapes and layers. Limit the color palette to two or three colors unless you like the cottage look. Blue and yellow or blue and pink go together well. White goes with everything. You can get some pink from foliage color and choose plants that bloom to complement each other or bloom in succession so you will have color all of the time. Blue daze (evolvulus) perennial in zones 8-11 low growing ground cover. azure blue flowers almost constantly open up in the early morning but close when the sun comes out at midday. In the afternoon, the leaves will evert themselves and it looks like a completely different plant. Russian sage, blooms nearly constantly with pale blue flowers. Blue flowers are hard to showcase unless you have a contrasting background or you are looking at them up close. My Russian sage is in an urn so it does not get taller than a couple of feet and it is in with a marjoram plant that has tiny white flowers. You could also plant thyme to cascade down the front of the urn. All of these plants like pretty much the same conditions. Lavender large mounds three feet high and wide with white to varying shades of blue flowers in the early summer. I grow lavender multifeda (zone 10 and up) it grows better than lavender augustifolia, it is ornamental and blooms nine months of the year. Agapanthus (Lily of the Nile) blue or white flowers in early summer. strap leaves the rest of the year. Lanceleaf coreopsis yellow flowers in early summer. Spreading mounds. Native wildflower. Deadhead. attracts beneficial insects. Perennial. Can take some shade but will bloom better with more sun. Daylily Stella D'oro for me they bloom March-Nov. Along the fence I would put something taller. My border is wider so I have shrubs in the back. I have a dwarf crepe myrtle "little chief", it does not reseed and flowers in summer (pink) but it is deciduous. Musaenda glabra (dwarf mussaenda) zone 9-11. yellow flowers and bracts most of the year. Shrub to 15 ft but can be pruned back. thryallis (shower of gold) zone 9-10 yellow flowers pretty much year round. Roses grandiflora (iceberg) white flowers, New day, sunsprite, Peace can give some height 5-6 ft.
You could also put a vine on the fence to soften it. Something like climbing First Prize. (pink rose), or honey suckle. Or some other narrow but tall shrub, annual or topiary for height. Depending on where you live and your micro-climate, you can cheat one zone up or down. Whatever you choose, make sure it is safe for pets and kids. Some plants may be toxic. I had to fence off my garden and orchids because my dog liked to chew up the oncidiums so I would chase him, and he liked to sit in the garden especially after I weeded and tilled it. I had to move every bromeliad I had to a no dog zone. He even punctured his tongue when he got a small branch stuck in his mouth and he panicked trying to get it out. I don't have the experience under my belt that posters above have, but I've been taking on some similar projects over the past year (with the helpful advice I've received here!). Since you received a lot of great plant suggestions I figured I would mention some tips for the overall process. I worked with a friend to add curves to her straight little narrow garden. I sprinkled flour on the grass to outline the new garden edge (some people use a garden hose to outline it), similar to the style in the photo Rainbowgardener referenced. We then dug out all the grass within the flour boundary. I'd recommend digging a day after a decent rain so that the soil is soft and easy to work with. We added some good compost and top soil to build the garden bed back up, planted, and mulched. I'd recommend maybe layering some newspaper around the plants before mulching to help suppress weeds and any grass roots from pushing back up. As far as plants go, Applestar mentioned "Russian sage is a good start, maybe add asters to complement the Russian sage, sundrops and coreopsis for yellow splash. Agastache. Penstemon" I have all of the above in a section of my garden and they have been very happy together, requiring very little water to thrive in a full sun location. I also have catmint and abelia shrubs in the same space. 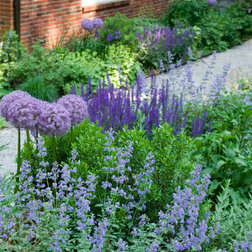 The purple lollipop looking flowers in Rainbowgardener's second photo are allium bulbs. I have the "Purple Sensation" variety and just love them! They should do well with the other plants mentioned and will look stunning I would think with that white fence as a backdrop to make them really pop! Fall is the time to plant some bulbs for spring flowering. don't forget to come back later and show us what you created! If you look at the first picture I posted, with the curves, it illustrates several design tips and tricks quite nicely: Tall things at the back, like the blue flowered hydrangea bush in foreground, sloping down to low trailing things in front. The hanging basket of purple petunias puts a pop of color at eye level, where it has a lot more impact. There are some plants in containers mixed in with plants in the ground, which automatically gives different height levels, as well as some material contrast. Some things are kind of hidden, so your eye can't see everything at once. In this case, in the middle (behind the little stone fountain, a very nice touch) there's a large tree?/pole? and a bunch of viney/branchy stuff. Everything behind that is kind of screened so you can't see it all at once. And there's some little statuary tucked in so it isn't all visible. There's a diversity of shapes and textures, with rounded stuff and spikey stuff. This is not a garden that was created over night. You need to have patience and keep working towards what you want. But I thought I would point out the principles behind what was done in that illustration. Thank much Green Thumb,imafan26 and Pinksand too. I'll copy some of your plant choices and for my puppy's safety. I'll definitely post after I turn over the place. I'm hoping to do after the peacock lili's bloom, in November. Is this a vegetable or plant? Annual or perennial ? Weed or herb? Do they look like garden sorrel? Re "Thanks much Green Thumb,imafan26 and Pinksand too"
If you meant me, my screen name is rainbowgardener (sometimes abbreviated as RBG). The words under our screen names are ranks that the forum automatically assigns, based solely on the number of posts you have made. So I'm Super Green Thumb, you are currently full member, imafan is greener thumb, pinksand is senior member. None of us picked those. The only point of having them is that you can look at someone's post and see whether they are a regular around here. But since the date of joining and the number of posts are also shown, it doesn't seem like the "rank" adds any info. Applestar is Mod (Moderator) which is a function. The mods help keep the Forum working smoothly, remove spam, moderate disputes, etc.